Take a medium-sized saucepan and pour the aloe vera juice into it. Place the saucepan over heat and let the juice get boiled. Then, put the comfrey leaves in the saucepan. It will take more or less 10 minutes to get the leaves soaked into the boiled juice. After that, take a small mixing bowl and strain the concoction into it. 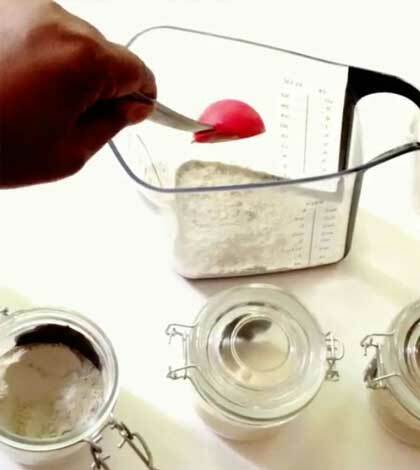 You also need to add rest of the ingredients like bentonite clay powder, grape seed oil, Irish moss powder and Norwegian sea kelp to the mixture at this stage. Blend everything properly with the help of a spoon and you will eventually get a muddy substance with a very thin consistency. Transfer it to a squeezing bottle and you are done. Mud wash is extremely beneficial for keeping our scalp free from everything like toxic materials, oil, sebum, dandruff, product build-ups, itching, etc. The bentonite clay powder is responsible for cleansing the scalp thoroughly without stripping moisture away from it. It also helps in preserving the healthy follicles, thereby promoting the health as well as smoothness of curls. Irish moss powder is rich in essential vitamins (A, B, C and D) and minerals (sulfur, potassium, etc. ), which provide nourishment to our hair follicles and keeps our curls moisturized at the same time. Aloe vera is another superfood for our scalp that works as a humectant and induces necessary moisture to it. It also plays an important role in maintaining the pH balance of our hair. The Norwegian sea kelp used in this mud wash is also full of minerals like zinc, magnesium, selenium, calcium, etc. as well as vitamin C, which feed and condition our scalp and hair. The zinc present in this ingredient is known to stop frequent hair fall. Comfrey leaf is another vital component of this mud wash that serves the purpose of an astringent. It prevents itching and soothes the scalp. Additionally, it can make each of our hair strands stronger significantly. Grape seed oil is a highly effective antioxidant agent. It contains lots of vitamin E which is crucial to get soft and healthy hair. So, just massage your scalp and hair with this mud wash regularly. You will get a clean scalp and beautiful tresses in no time.